I grew up in a family that never ate BBQ chicken; well when it comes down to it never really ate anything with BBQ sauce. I am not quite sure why that was. Maybe my mom wasn’t a fan, so you know how that works… if the cook doesn’t like a type of food it’s not going to be on the menu. When I married Mike, things changed. Yep, he loves BBQ sauce almost on anything. To tell the truth, I love it as much as he does. And as for the other guy in the house, our son Adam; he loves BBQ sauce… he is the guy that eats it on just about everything. Yeah, I have seen him eating on kinds of things that I would have never thought of, such as French fries. I think that it is his go-to condiment. 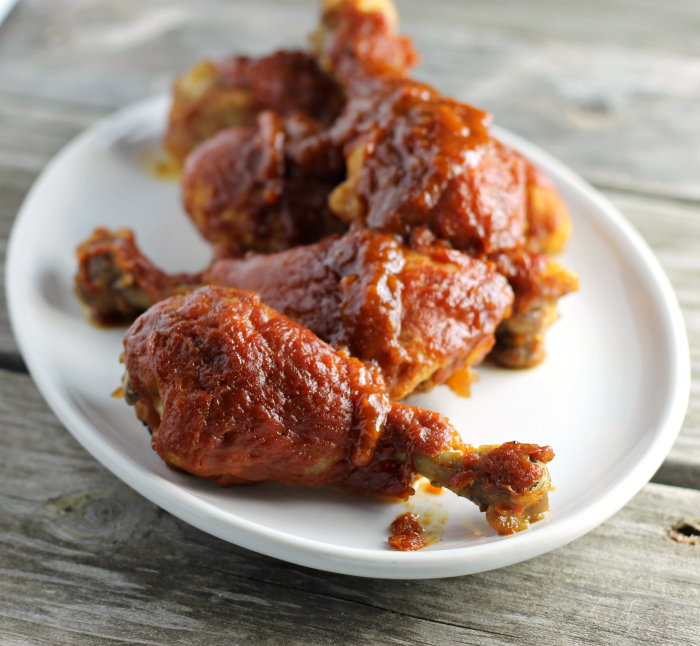 This slow-baked BBQ chicken drumstick recipe is my new love when it comes to BBQ recipes. Yeah, it really is that finger licking good. I started out with making a rub for the chicken. Once the rub was added to the chicken I set in the refrigerator for about an hour, so the flavor could soak in. After the chicken was in the refrigerator, it was baked in the oven for an hour at a low temperature. Oh yeah, I covered the baking pan with the aluminum foil so that the chicken would stay moist. After the hour of baking, it was then covered with BBQ sauce and then baked another hour at the same low temperature so that BBQ sauce could bake into the chicken. As for the rub, it has a bit of a kick to it, which you can change up if you don’t like spiciness when it comes to chicken. This is my second time around when it comes to making this recipe. The first time I didn’t add the BBQ sauce or any heat to the recipe and to tell the truth I found the chicken to be a bit boring. The chicken turned out super moist and was loaded with flavor. It took a lot of time, but overall it was very easy to make. 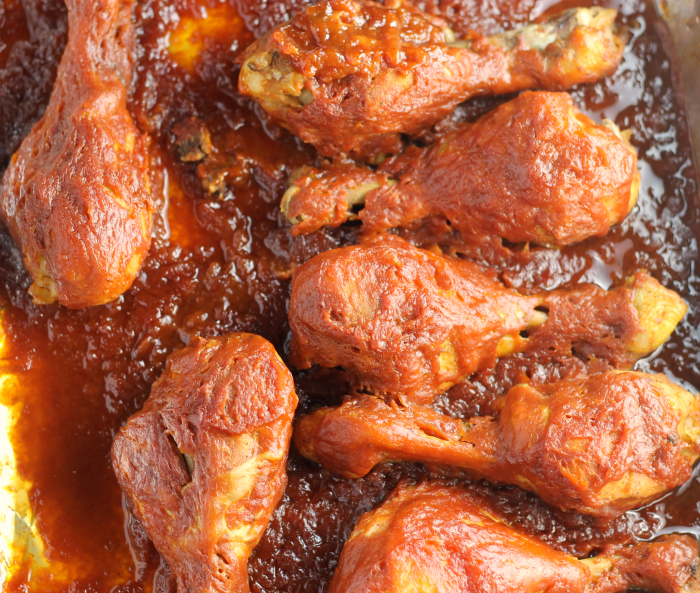 As I mentioned earlier in this post these slow-baked BBQ chicken drumsticks is a great recipe to make on a lazy Sunday afternoon when there is not much going on. For the rub combine all of the ingredients (except the chicken) into a large Ziploc bag. Once the ingredients for the rub are mixed together, add the chicken. Make sure that all of the chicken is coated with the rub and set in the refrigerator for about an hour or two. Preheat the oven to 300 degrees F. Line a 9 by 13-inch baking dish with aluminum foil and spray with a non-stick cooking spray. Remove the chicken from the refrigerator and place it in the prepared baking pan. Cover the baking dish with aluminum foil and seal the edges. Bake in the preheated oven for an hour. While the chicken is baking mix together the BBQ sauce. Add all of the ingredients into a medium bowl and mix well. Set aside. Once the chicken has baked an hour remove from the oven. Remove the aluminum foil carefully, there will be a lot of steam that comes out when you start taking the foil off of the pan. Remove the chicken from the baking dish and remove all of the liquid for the dish. Spread some of the BBQ sauce on the bottom of the pan, enough to cover the bottom. Place the chicken back in the baking dish and pour the remaining BBQ sauce over the chicken. Place the aluminum foil back over the pan making sure that edges are sealed again. Place back in the oven and bake for another hour. Remove from oven and enjoy. I didn’t grow up eating much BBQ sauce either—but Bill sure loves it! This sounds perfect for a winter family meal! 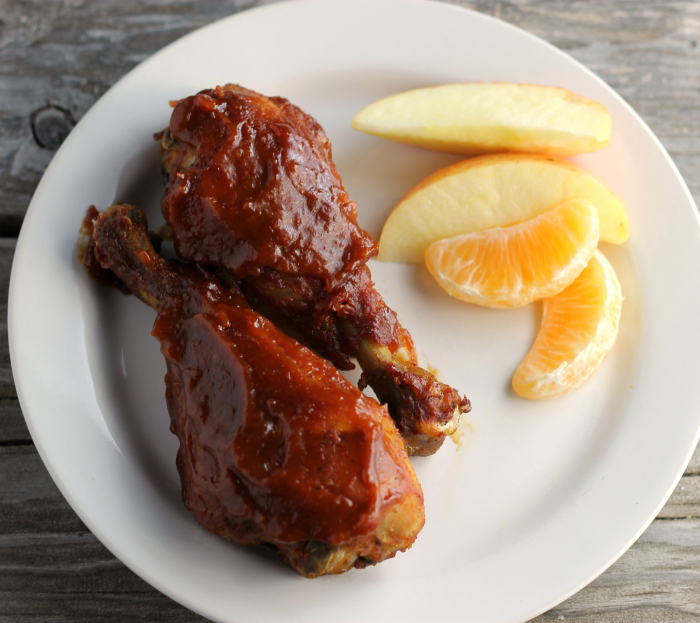 BBQ chicken is always a hit, and drumsticks are so fun to eat! 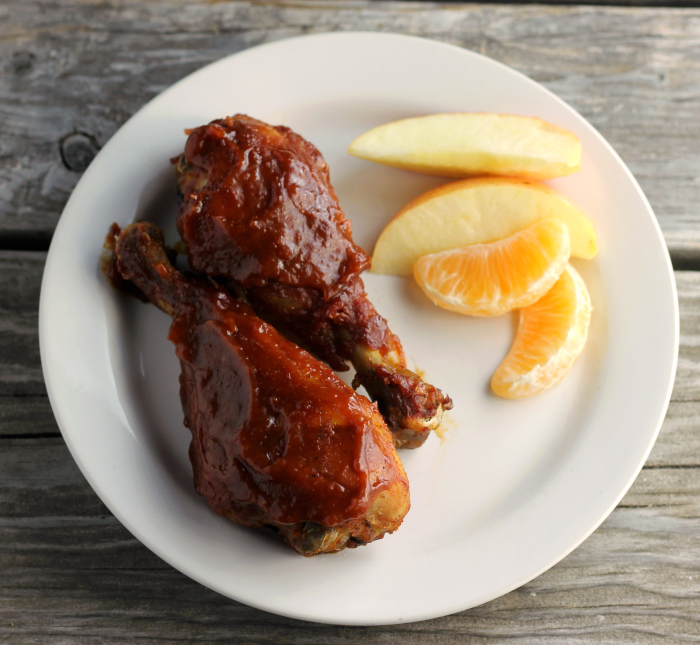 Homemade BBQ sauce always tastes so much better than store bought! 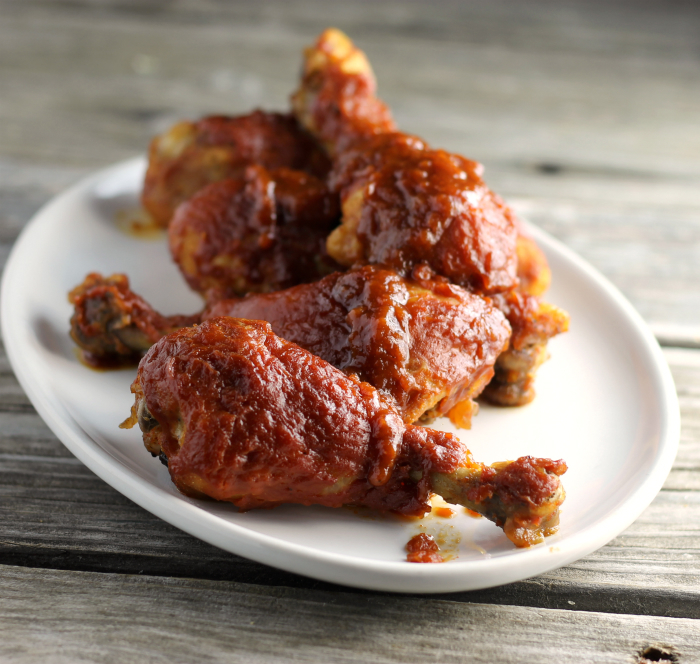 Your homemade spice rub and BBQ sauce sound so tasty, and the chicken looks amazing! OMG yum! These sound soooo good!